Guys, this one is a doozie! You all know how much I love discovering makeup dupes. I have viral content on Pinterest for it, and I have even been asked to speak at the Texas Pinners Conference about it! I would say that discovering amazing drugstore makeup is one of my specialties. I make recommendations to you all the time, but today I am going to be showing you exactly how they look next to their high-end counterpart. 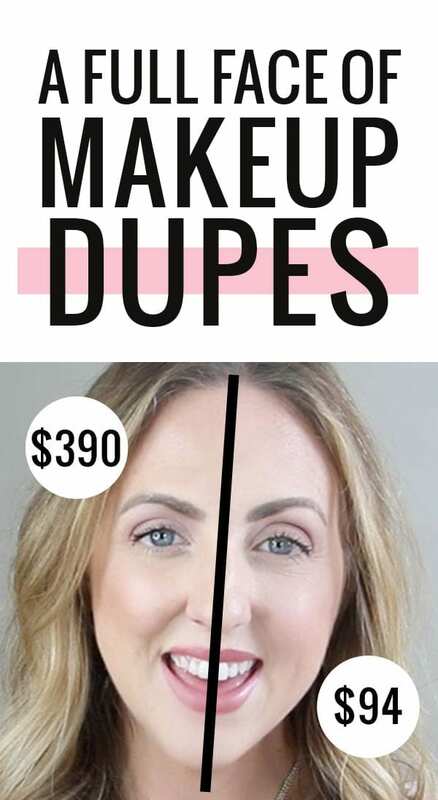 It’s a full face of makeup dupes! My right side (your left) will be done with the high-end product, and the other side with the drugstore product. Can you tell the difference? This video is a bit of a longer one because I really go in depth, and even show swatches of high end vs makeup dupes. You also will catch some glimpses of Caroline, haha. I worked really hard on this video and I very much hope you all enjoy it! So, tell me. Which high end product are you going to ditch for it’s drugstore counterpart? I sure as heck can’t pick a favorite… such great dupes! If you loved this post and video, pin the image below for me! Thank you! Be sure to check out more videos before you go! I feel the weirdest sense of pride that a lot of the drugstore products are already favorites/staples of mine, especially the mascara and Maybelline primer! But this is so cool, I love love love dupes! Great products on both sides. Very close! This is great! I love a good dupe and you discovered some awesome finds! I love that you do these dupe posts! I have such bad skin that I get nervous to wear make-up, but I always love the look of it on! PS. The newest post (Caroline’s fiesta) – you and Katie look great! Miss you ladies!! So I bought a few brow products today, because the Maybelline pencil liner that I’ve been using for 15+ years (not the same pencil, just the same product. Ha!) is crap and I’m in need of a serious brow overhaul. While I love the two items I bought, the $48 price tag hit me hard. Bought Benefit’s precisely, my brow pencil, and gimme brow. Thinking of switching the pencil out for the Loreal one you mention in this post. Any suggestions on a dupe for the volumizing fiber gel brush? The Covergirl rose palette is so beautiful! You did such a great job putting together this list! Do the drugstore products last as long as the high-end? I feel like they do! Great video and suggestions. To me the blush looks a little different as the high end one is more pigmented and heavy, but I like the look of the drugstore one better. Will definitely try the foundation and concealer! Thank you! 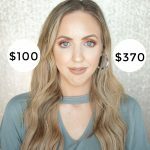 What is the best primer to cover large pores?? NYX Pore Filler works best for me, cheaper than Benefit Porefessional. The NYX Pore Filler is awesome! It’s because the right side of the picture (the left half of my face) is the closest to the window.